New VW CEO Herbert Diess sets sights on U.S.
Diess assumed direct responsibility for North America. FRANKFURT — Herbert Diess, Volkswagen Group's new CEO, is out to accomplish what no predecessor since Ferdinand Piech has achieved: Turn a profit in the U.S.
Elevated to the top job last week after just three years at the company, the 59-year-old ex-BMW executive has a reputation for delivering on his restructuring targets — and high on his to-do list is ending the string of losses in the world's second-largest car market. "In realigning the Volkswagen brand, he has demonstrated to impressive effect the speed and rigor with which he can implement radical transformation processes," said Diess' boss, VW Supervisory Board Chairman Hans Dieter Poetsch, last week. The supervisory board approved sweeping corporate changes, including naming Diess to replace Matthias Mueller as group CEO. As brand chief, Diess' commitment to North America has been unwavering, VW insiders say. "He directly assumed responsibility for the region, making it a matter for the boss personally," said a company source in Wolfsburg last week. "It would surprise me if that were to change." Officials say he insisted on traveling to Detroit in January to present the redesigned Jetta himself as a demonstration of Wolfsburg's commitment to the U.S.
Diess has targeted a 5 percent market share for the U.S., up from 2 percent last year. "We believe it's possible, not in the short term — we think it's going to be a 10-year plan," Diess said last month. "America is very important for us." "We have a good foundation," he added. "We will come forward with two new products every year specifically tailor-made to hit the core segments of America." That's putting a positive spin on what has long been the group's most glaring weakness. Globally, Volkswagen vies for the title of world's largest automaker, but in the U.S., the group ranks eighth. All the group's brands combined sold just 625,068 vehicles in the U.S. last year, less than half the volume moved by its closest rival, Hyundai-Kia. Volkswagen hasn't posted a profit in North America in the last 15 years, spanning three group CEOs. When the now-disgraced Martin Winterkorn took over the CEO job from Bernd Pischetsrieder in 2007, he chose to stop reporting regional earnings. In 2006, the group had narrowed its losses in the North American Free Trade Agreement region to a still eye-watering €607 million (then about $806.5 million). Depreciation charges and low contribution margins from its 7-year-old, underused Chattanooga plant only worsened the problems. In the wake of the diesel-emissions scandal, Volkswagen's board of management handed more control to Volkswagen Group of America CEO Hinrich Woebcken to operate almost all aspects of the region, including purchasing, product planning and production. Woebcken's strategy of moving VW pricing downward — the 2019 Jetta will launch in a few weeks at a lower price than its predecessor — should help dealers bring in new customers. Already, Diess and Woebcken have been making progress. VW brand sales are recovering from the scandal and an overdependence on sedans and hatchbacks in a market that has swiftly moved toward crossovers, pickups and utility vehicles. Sales through March are up 10 percent, led by two new three-row crossovers introduced in 2017 — the Atlas and long-wheelbase Tiguan. The newcomers have passed Volkswagen's longtime lineup leader, the Jetta. "It's not like they have lightning in a bottle, but at least there is some wind in their sails," said Edmunds analyst Jeremy Acevedo. "With the changing of power ... it's a great time for a company like this on the uptick to continue its strides here in the U.S."
Still, Diess and Woebcken know that two crossovers won't be enough. Last month at the New York auto show, VW showed two concepts aimed at expanding Atlas into a subbrand: the two-row Atlas Cross Sport, which will be the basis for a new vehicle to be built next year in Chattanooga, and a unibody pickup called the Atlas Tanoak. Both would help increase use of the Chattanooga plant, where the Passat is also built. 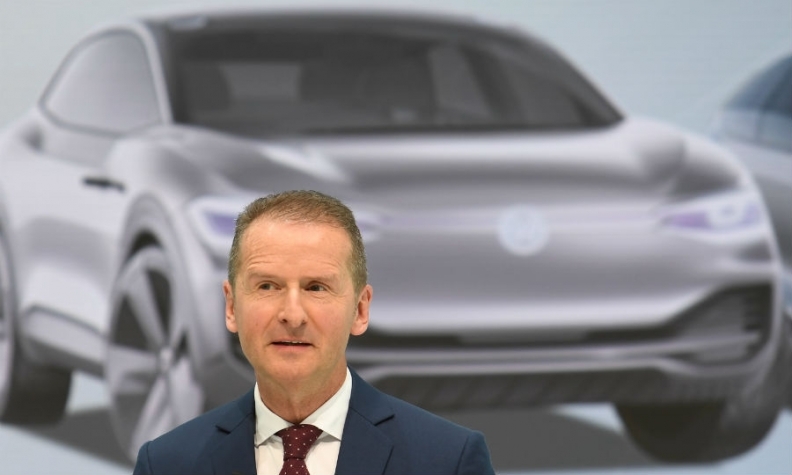 Diess, speaking at his first news conference as CEO last week at VW's headquarters, said VW would streamline into a more compact structure. The manufacturer will create a COO post for the VW car brand to alleviate Diess' workload. The reorganization focuses power in Diess' hands, as he will also gain oversight of group r&d plus what the automaker is calling Vehicle IT, or connectivity. CFO Frank Witter will add responsibility for corporate information technology, while Audi chief Rupert Stadler will additionally manage group sales and Porsche unit chief Oliver Blume will oversee production for the group. For Diess, it is a challenge, and an opportunity, particularly in the U.S.
"In a phase of profound upheaval in the automotive industry, it is vital for Volkswagen to pick up speed," he said in his first comments as group CEO. If he turns the U.S. business into a reliable profit contributor, he might set himself up to be the first Volkswagen Group CEO since Piech departed in 2002 to be able to leave on his own terms.